What does crew cut mean? A crew cut is a short men's hairstyle, with shorter sides and longer top. The style was popularized by Ivy League crew teams in the 1930s and is still associated with preppy fashion today, though it is an extremely widespread male hairstyle. Do they still call McCoy's "Man crisps" in England, or has a woman with a crew cut, a flannel shirt and a pickup truck complained yet? The lady at my complex with the crew cut just walked through the building with a Van Halen t-shirt on with a lit Red Buck hanging out of her mouth. SHEEEEESH! Growing up, [Timothy] McVeigh didn't appear to stand out, working at Burger King and a security guard. With his crew cut, the son of a automobile factory-line worker and homemaker looked the part of an all-American and even joined the military, where he became a decorated Army veteran before leaving the service...Pictures show him with blond hair, blue-green eyes and chiseled features, dressed in a preppy style. Where does crew cut come from? To understand the history behind crew cut, we have to go back to the 1570s. That’s how long we’ve been referring to a group of people as a crew (it originally referred to soldiers in the 15th century). By the 1690s, we had narrowed that definition a bit, with a crew as a group of people working together at some common task, especially crewmen on a ship. The term crew cut was first recorded in the 1930–40s to describe the hairstyle of Ivy League students on the crew team (rowing). They cut their hair shorter on the sides and longer on the top to streamline their appearance (and performance). According to Yale University publications, it was student rower John Hay Whitney who asked for a German-style haircut in the 1920s. His barber supposedly suggested a more American name for the haircut, given that all things German were understandably unpopular at the time. The crew cut was born. As with all fashion, crew cuts have come in and out over the years since the term was coined. Within the past decade, interest has risen in it as men’s hairstyles tend toward the short end of the spectrum, à la David Beckham. Crew cuts often find themselves on lists of top men’s hairstyles. It’s not all David Beckham and Zayn Malik, though. Women like Katy Perry and Emma Watson have also rocked a crew cut in the past few years. The crew cut hasn’t fully grown out of its Ivy League roots. In fact, this hairstyle is still considered preppy. 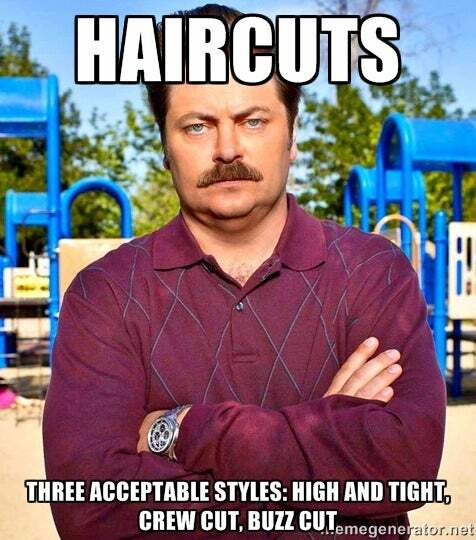 You can also, though, expect to see men’s crew cuts associated with straight, unstylish white dudes. The implication is that because the style is so easy to maintain and popular, men who don’t put that much effort into their appearance opt for it out of laziness. Straight Eye: um, you should get a crew cut, a multi-colored array of polo shirts, get some cargo shorts (at least one pair of camo), and A LOT of Axe body spray. Women with crew cuts, on the other hand, are sometimes seen as badass for going against gender norms. Other times, women with crew cuts are stereotyped as lesbians and, most often in the same breath, denigrated as too liberal or outspoken. Emma Gonzalez is even more badass than Katniss Everdeen though. And rockin’ the crew cut. Humans aren’t the only creatures that can rock a crew cut. Sometimes, pet haircuts are referred to as crew cuts too.